First Line: Lustre. That was what had been missing and was suddenly back. The Armistice Ball brought it all back: the time before the War when people weren't burdened by the weight of so much sorrow, so much death, so much needless destruction. At the Armistice Ball, people could wear their best clothes, bring all their best jewelry out of the vaults, laugh and gossip and act as though they'd never had a care in the world. Lena Duffy wore all her magnificent diamonds to the Armistice Ball; people certainly remembered them. But much later when the diamonds are once more taken out of the vault, this time to have copies made, they are found to be fake. Lena says the real diamonds had to have disappeared at the Esslemonts' ball, and the Esslemonts should be held responsible for restitution. Daisy Esslemont disagrees and asks her friend Dandy Gilver to conduct a discreet investigation. Dandy, who feels as though she's going to seed with her children away at school and her husband more concerned with his contractor, decides to do it. She knows everyone involved and has some questions of her own about those diamonds, but when one of the suspects dies, the stakes seem much higher than they did at the beginning. With the help of Cara Duffy's fiance, is Dandy going to be able to solve her very first case? I've heard some good things about Catriona McPherson's Dandy Gilver series over the years, and since I love Scotland and that period of time, I thought it was time to give the first book in the series a try. I've read many books about World War I and the years leading up to the conflict as well as its aftermath. The prologue of After the Armistice Ball immediately wove its spell and took me right to that time when the fighting was finished, and people were taking their first tentative steps in a brand-new world. I also fell in love with Dandy Gilver and her slightly arch, slightly sarcastic, sense of humor. Her husband is a paragon of predictability, and I had fun watching Dandy as she plotted how to take her little investigative tours with spouse Hugh being none the wiser. The mystery of the diamonds and the murder is a true puzzler, and Dandy definitely needs the help of Alec Osborne, fiance of Cara Duffy. There are real diamonds, there are fake diamonds, there are false trails, and people aren't always whom they seem to be. I joined Dandy in confusion on more than one occasion. However, one thing about this book drove me up the wall and across the ceiling: how Dandy and Alec came to solve the crime. How? By endless talk, talk, talk, talk, talk, talk, talk. And when these two weren't rehashing everything for the millionth time, Dandy was think, think, think, think, thinking about it. This book told me that I need a bit more action in my mysteries, and it reminded me of something else. As a rule, I don't read Golden Age mysteries because I don't enjoy them-- especially if the crime solver is a female. Most females of the era don't have unlimited travel privileges. They have a few opportunities to see, observe, and question, and then they must retire to their parlors to ponder everything over endless cups of tea. 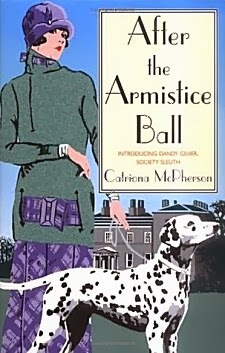 After the Armistice Ball is written in the style of one of these classic Golden Age mysteries. If you read them and enjoy them, you're going to love Dandy Gilver. Unfortunately, although I enjoy Dandy Gilver, Golden Age mysteries just are not my cup of Darjeeling. From the things other Dandy fans have said, I would agree with you, Margot. I may try again in the future. I haven't heard of title or author so will check them out. If you like Golden Age, Jane, you should fall in love with Dandy Gilver! This sounds like it should have been really good.